Patrick, Ireland's patron saint, is commonly known as the man who in 432 single-handedly brought Christianity to the Irish and drove the snakes out of the Emerald Isle. While both these claims are suspect, the historical Patrick seems to have been a very successful missionary in the northern part of Ireland. And a tour in his footsteps certainly makes for an interesting departure from the beaten track. The tour starts in Dublin, at St Patrick's Cathedral - while the current structure owes much of its appearance to the 19th century and has been erected in the 13th. Today's "National Cathedral of Ireland", however, replaces a far earlier structure commemorating Patrick. The saint himself is said to have baptized converts at a "holy spring" nearby. Indeed a spring covered with a slab bearing a cross has been found during renovation work. Today it can be seen in the cathedral. Also still on view are the banners of the Knights of St Patrick, an order of chivalry instituted by the British King George III in 1783 but practically defunct since 1922. The second place to visit in Dublin is the National Museum in Kildare Street. In the collection of medieval artifacts, two have a reputed connection to Patrick. A beautiful "bell shrine" dates from around 1100 but was used as a reliquary to commemorate the saint. And a simple iron bell is on view as well. With this bell, Patrick called the believers to mass - at least according to tradition, science dates the bell to the 6th or 8th century. Statues, murals and church windows depicting Saint Patrick, more than often in unhistorical attire, abound in Dublin as they do everywhere in Ireland. The Hill of Slane, a quite noticeable landscape feature, was already used in prehistoric times as a place of pagan worship, or for pageants. There may be a connection to the nearby Hill of Tara, the ancient seat of Ireland's High Kings. 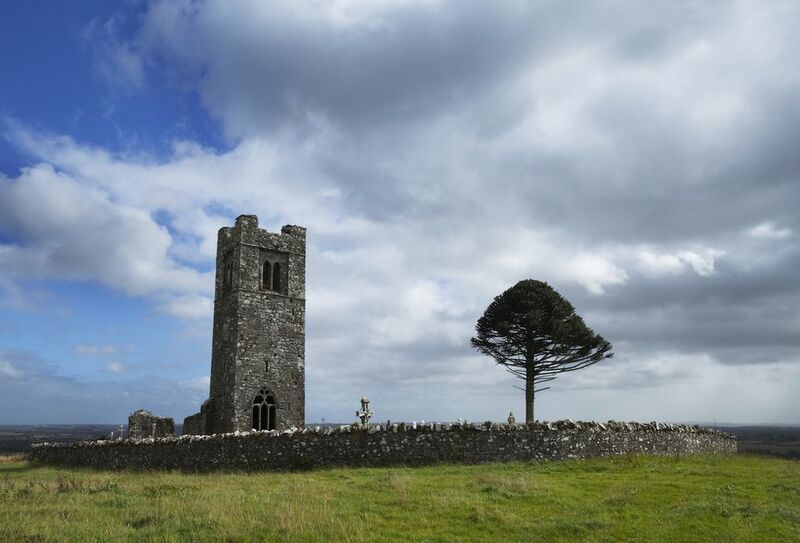 Around Easter, Patrick chose the Hill of Slane for his spectacular showdown with the heathen King Laoghaire. Just before Laoghaire could light up his traditional (and royal) spring fire on Tara, Patrick lit his paschal fire on the Hill of Slane. Two opposing fires, representing opposing belief systems, on opposing hills - if there ever was a spiritual "Mexican stand-off" this was it. Today the Hill of Slane is dominated by ruins and graves. Patrick himself is reputed to have built the first church here, later Saint Erc founded a monastery next to it. The ruins seen today are of later vintage though, building and renovating works having obscured all traces of early Christianity. From Slane, you will then drive right across Ireland into the West, passing Westport with its historically correct statue of Patrick (as a lowly shepherd), and finally arriving at Clew Bay. This is Ireland's "holy mountain" - indeed religious rituals seem to have been celebrated as early as 3000 BC on the small plateau at the top! The impressive mountain next to the sea seems to have attracted devotees at all times, prehistoric sacrifices were enacted here. Patrick himself climbed the mountain to find peace and solitude. Spending forty days and forty nights fasting on the top, wrestling demons and desires, all for the spiritual welfare of his Irish brethren. So successful that his feat is still remembered and celebrated today. Which in turn means that peace and solitude are harder to find on Croagh Patrick today! If you want to climb the 2,500 ft high mountain start at Murrisk. You can buy or hire stout walking sticks here (recommended), and check out the requirements for a pilgrimage. From Croagh Patrick then make your way eastwards and northwards into Donegal, heading for Lough Derg and St Patrick's Purgatory. The Tractatus de Purgatorio Sancti Patricii, written in 1184, tells us about this place. Here Patrick supposedly entered purgatory and lived to tell the (harrowing) tale. While the historical background is vague at the best, the small island in Lough Derg became a pilgrimage site in the middle ages. In 1497 the pope officially declared these pilgrimages as undesirable, and Puritan Cromwell's soldiers destroyed the site. But in the 19th-century interest in St Patrick's Purgatory was revived, and today it is one of the most popular pilgrim's sites in Ireland. During the main season (between June and August) thousands are visiting Station Island on organized retreats. Some are only guests for a day while others undertake three days of prayer and fasting, standing in ice-cold water and sleeping only short periods. The pilgrimage is variously described as an "inspirational recharge of faith" or a "penance for sin". It certainly is not a tourist attraction per se. Visitors just curious about the history of Lough Derg will find the Lough Derg Centre in Pettigo more to their liking. City of Armagh - the "Cathedral City"
No other city in Ireland seems to be more dominated by religion than Armagh - one cannot throw a stone without destroying a church window! And both the Catholic Church as well as the (Anglican) Church of Ireland see Armagh as the center of Christian Ireland. Both denominations have massive cathedrals on opposing hills! The Cathedral Church of St. Patrick (Church of Ireland) is the older and more historic of them. Legend tells us that in 445 Patrick himself built a church and founded a monastery here, elevating Armagh to "prime church of Ireland" in 447. A bishop has been resident in Armagh since Patrick's time, in 1106 the title was elevated to archbishop. High King Brian Boru is said to be buried in the cathedral grounds. Patrick's church, however, survived neither the Viking raiders nor the turbulent middle ages. The present cathedral was built between 1834 and 1837 - officially "restored". Built of red sandstone it incorporates older elements and has other artifacts on display inside. The visually striking stained glass windows are worth the steep climb alone. Make a point to visit the Ulster Museum next to the Botanical Gardens and the imposing Queen's University. Apart from gold salvaged from the Spanish Armada and an eclectic collection of art and artifacts, the bunker-like museum contains a shrine in the form of a lower arm and hand. This richly decorated gold case is reputed to house the actual arm and hand of Patrick. The fingers displayed in a gesture of blessing. Maybe not a true relic but certainly impressive. Spend some time sightseeing and shopping in Belfast, and then head southeast, following the roads along Strangford Lough to Downpatrick. Originally the hill had been used for defensive earthworks in prehistoric times and Patrick was busy nearby. But when the saint died in Saul (see below) a number of congregations claimed the undisputable right to bury him. All other congregations naturally disputed exactly this. Until a monk suggested a higher authority to settle the matter, hitched two wild oxen to a cart, bound Patrick's body to the cart and let the oxen run free. They finally stopped on the hill and Patrick was laid to rest. A massive granite boulder with the simple inscription "Patraic" marks the reputed burial site since 1901. Why exactly Frances Joseph Bigger chose this spot is unclear. The early church did not survive - in 1315 Scottish troops ransacked Downpatrick and a new cathedral was only finished in 1512. This fell into disrepair and was finally rebuilt in a romantic "medieval style" between 1790 and 1826. Today the mock-medieval cathedral is a gem! The small dimensions and elaborate yet tasteful details lend it a unique charm. Below the cathedral, you will find the modern Saint Patrick Centre, a multimedia celebration of Patrick's Confessio. A visit is a must, this is one of the best attractions of its kind in Ireland. The crowning glory is a film presentation in a special theater with near-180°-screens, making the helicopter flight through Ireland very dynamic indeed! Now you are near the end of the tour - from Patrick's grave take a short drive to the village of Saul. In this unremarkable area, one of the most important events in Ireland's history took place. It is said that Patrick landed near Saul in 432, obtained a piece of land as a gift from the local lord, and proceeded to build his first church. 1500 years later a new church was erected in memory of this momentous occasion. The architect Henry Seaver built the small, inconspicuous St Patrick's Church, adding a fair representation of a round tower and just one stained glass window depicting the saint himself. A fitting tribute. And an ideal, usually quiet, place for a meditation on the saint and his works. After this, you may complete your tour by driving back to Dublin.